Origin is available to vendors who want to package it with their own products. As such, the Origin OEM version can either be directly bundled with your products or it can be customized to meet your specific data analysis and graphing needs. 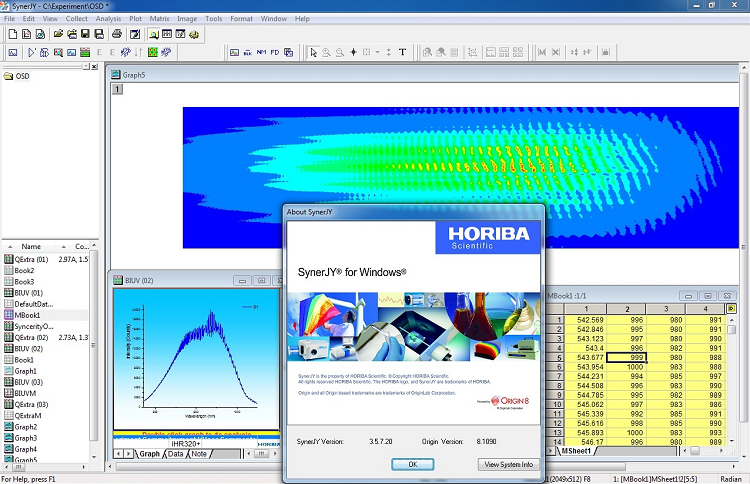 This screenshot of SynerJY™, a general purpose data acquisition and data analysis software for HORIBA Scientific's spectroscopic systems, shows how Origin has been integrated into their software. Custom menus, dialog boxes, and routines can be created to perform graphing and analysis tasks that are tailored for your product(s). Dialogs can include Microsoft® ActiveX® components that you develop, or procure from other vendors. Custom analysis routines can access external DLLs. Origin can be accessed as an Automation (COM) Server by client applications such as LabVIEW, Microsoft® Excel and from custom applications built using Microsoft® Visual Basic®, Microsoft® Visual C++®, etc. The Origin OEM interface can be modified to mention your product and company name instead of Origin/OriginLab. When accessing Origin as an Automation (COM) Sever, your application can remain in the foreground, and the Origin session can remain hidden, if necessary. Your application can then send data, such as data collected by your instruments, to Origin for specific graphing and analysis tasks. The graph images and results of the analysis can then be sent back to your client application. Malvern's MicroCal systems have incorporated Origin OEM into their product line with routines built exclusively for the analysis of calorimetry data produced by their instruments. HORIBA Scientific has incorporated Origin OEM into their SynerJY™, FluorEssence™ and Aqualog™ software product lines. SynerJY™ is general purpose data acquisition and data analysis software from HORIBA Scientific. Tailored for spectroscopic systems, SynerJY™ allows users to conduct experiments, adjust hardware parameters, evaluate and analyze data and prepare data for reports, all with a click of the mouse. The software is designed to automate repetitive functions and allows users to define and save all experimental parameters. SynerJY™ uses Origin as a platform to handle all its data analysis and reporting functions, taking advantage of Origin's peak search and peak fitting routines for spectroscopic analysis. In addition, HORIBA Scientific has worked with OriginLab to develop several custom analysis routines for peak analysis, spectral data extraction from image data, and simple spectral mathematics. The OPJ project format has become the standard for HORIBA Scientific's Optical Spectroscopy Division for data storage and allows users to store data, graphs, and experiment information all in the same file. Origin is used in hundreds of labs worldwide, thus the learning curve for adopting a new analysis tool is drastically reduced. Hysitron is a leading manufacturer of nanomechanical test instruments for the material research scientist. Tests include nano-hardness, fracture toughness, elastic modulus, stress-strain, friction, wear and scratch resistance of bulk materials, ultra-thin films, electrical resistance during indentation, nanostructures (MEMS) and nanocomposites. Hysitrons family of nanomechanical test instruments includes the TriboIndenter® comprehensive test system, TriboScope® interfaced to commercial AFMs, the Ubi 1®, a dedicated scanning nanoindenter; the nanoECR for simultaneous electrical measurements, and the nanoTensile 5000. All Hysitron indentation instruments offer proprietary SPM imaging, allowing pre- and post-test in-situ imaging. Advanced features such as quantitative stiffness mapping of modulus (modulus mapping), dynamic testing (nanoDMA), and acoustic emission monitoring during nanoindentation are available. OriginLab can work with you in any capacity you need to customize Origin OEM to suit your needs. To learn more about how Origin OEM can work for your company, contact us. To learn more about the general capabilities of the regular version of Origin, click here.